Children enjoying their Saturday respite program. We currently offer two Saturday recreation programs – one with a focus on recreation and the other with a focus on social skills for children with autism. 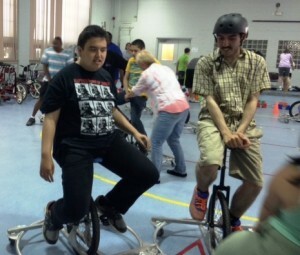 We also offer a vacation respite recreation program for children with developmental disabilities. Vacation respite recreation is offered three times a year: December, April and August. To be considered for these programs, children must have a Medicaid waiver of be eligible to receive Medicaid waiver services. All programs include a wide range of skill enhancement through music, arts and crafts, cooking, movement dance and indoor and outdoor play. Swimming in the outdoor pool is available during the summer months. To be considered for the recreation programs, the child must have a Medicaid Waiver or be eligible to receive Medicaid Waiver services.